Kemp claims win in governor's race. ABC News has not projected a winner. Georgia Secretary of State Brian Kemp has declared victory in the gubernatorial race and says he is stepping down as the state’s top election official Thursday to begin his transition to governor. “I wasn’t really concerned about that but I think in light of where we are now, this will give public confidence to the certification process,” Kemp said. 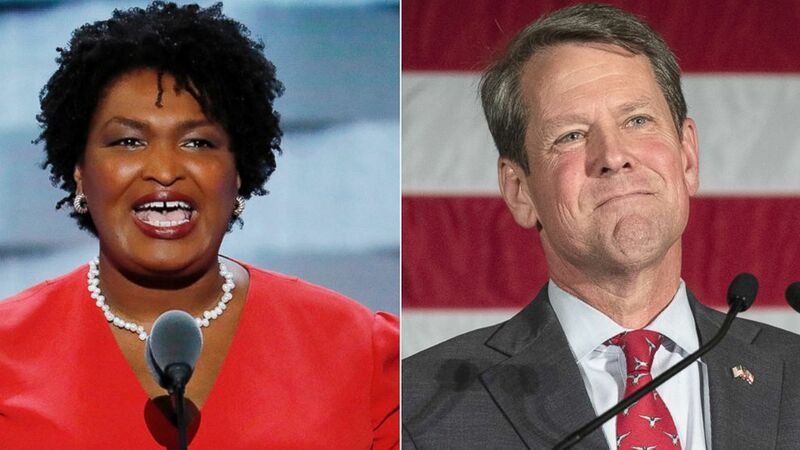 But Abrams’ campaign criticized how the election was handled, including Kemp’s declaration of victory before all the votes have been counted, and said Kemp’s resignation came only after he oversaw the election. “He decided to not resign. He decided to oversee his own election. That was not our choice. He owns this, and he owes the people of Georgia an explanation,” Abrams’ campaign manager Lauren Groh-Wargo said in a press conference Thursday. While Kemp leads Abrams 51 percent to 48 percent, he is not more than 1 percentage point away from breaking 50 percent — which is required for victory in Georgia. Her campaign’s legal team laid out the strategy going forward at Thursday’s press conference. The campaign also said they are filing a lawsuit in Dougherty County, which was hit by Hurricane Michael, claiming that voters were denied the opportunity to cast ballots by mail during the general election. “All the votes haven’t been counted. How can anybody claim a victory when there are enough votes that have not been counted that could cause a run-off here?” asked John Chandler, a member of Abrams’ legal team. “We will litigate until we determine that every person’s vote has been counted,” Chandler said. “The Secretary of State Brian Kemp owes voters an explanation. We need to see lists, we need to see counts of every single vote. We need to see all the military provisional numbers. They all need to be counted. We do not believe any of these numbers are credible,” said Groh-Wargo. Allegra Lawrence-Hardy, a member of Abrams’ legal team, thanked voters for fighting to get their ballots accepted. “Stacey Abrams has been fighting for people her whole life and we are going to keep fighting for every voter,” Lawrence-Hardy said. Kemp, speaking at his press conference, said about 20,000 provisional ballots remain uncounted in the race — a number that he said is not enough to put Abrams over the top. ABC News’ Johnny Verhovek and Steve Osunsami contributed to this report.